Dermicidin, colored by subunit (left) and by atom type (right). Bacteria are a constant threat, so our bodies have many defenses to protect us from infection. One of our first lines of defense is a collection of small peptides, termed antimicrobial peptides, that are secreted from our cells. These peptides are toxic to a broad spectrum of bacteria, binding to their membranes and disrupting their function. For instance, dermcidin is an antimicrobial peptide secreted by sweat glands that attacks any bacteria on our skin. The active form of the peptide is 47 amino acids long. As seen in the crystal structure (PDB entry 2ymk ), it folds into a long alpha helix, and then six copies of the peptide assemble to form a pore that penetrates the bacterial membrane. This allows ions to flood across the cell membrane, ultimately killing the cell. The trick to the function of dermcidin is the arrangement of amino acids in the helix. The helix is amphipathic, which means that the two sides of the helix have different chemical characteristics. 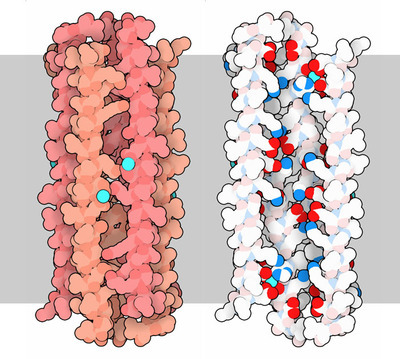 One side has many charged amino acids, (shown here in bright red and blue on the right-hand image; two chains are removed to show the inside), and the opposite side is mostly carbon-rich amino acids, shown in white. 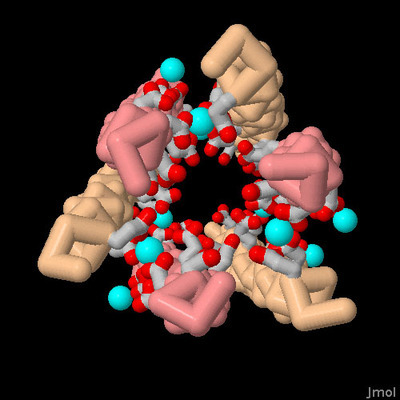 This is perfect for creating a pore through a membrane: all the carbon-rich amino acids line up outside and interact with the membrane, and all the charged amino acids line the pore and create a perfect tunnel for ions and water to flow through the membrane. Of course, a membrane-puncturing peptide would also be dangerous for our own cells, so antimicrobial peptides need to be able to target bacteria specifically. They do this by taking advantage of a difference between our membranes and bacterial membranes. Bacterial membranes typically have many phospholipids, which carry a negative charge, whereas the lipids in our membranes are mostly neutral. So, most antimicrobial peptides carry a strong positive charge, and prefer to bind to bacterial membranes. Oddly, however, dermcidin has an overall negative charge, so it relies on positively-charged zinc ions, which are abundant in sweat, to assist with its specific interaction with bacterial lipids. Two antimicrobial peptides, with charged atoms in bright blue and red. These small peptides are so effective that they are deployed in many different types of organisms. They come in many shapes and sizes, but they share the amphipathic structure that allows them to pierce through bacterial cell membranes. Two examples of human antimicrobial peptides are shown here. On the left is a defensin (PDB entry 1dfn ), which forms a tightly folded ball stitched together with three disulfide linkages. This helps to protect it from protein-cutting enzymes in the bacterium that would destroy it. 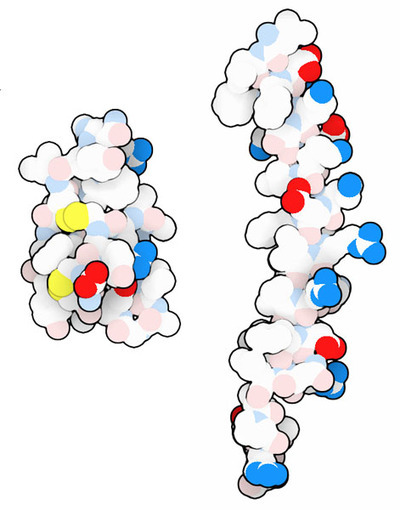 On the right is LL-37 (PDB entry 2k6o ), which forms an alpha helix much like dermcidin. Many other examples may be found the PDB archive. The structure of dermcidin (PDB entry 2ymk ) shows how the zinc ions assist the creation of a membrane-puncturing pore. The zinc ions bridge negatively-charged amino acids in neighboring chains, stitching the whole complex together. To take a closer look at this interaction, click on the image for an interactive Jmol. Structures for many different antimicrobial peptides are available in the PDB archive. You can start by searching with the term "antimicrobial". Many antimicrobial peptides are stabilized by disulfide bonds. Try searching for "defensins" to see some examples. C. D. Fjell, J. A. Hiss, R. E. W. Hancock & G. Schneider (2011) Designing antimicrobial peptides: form follows function. Nature Reviews Drug Discovery 11, 37-51. L. Hazlett & M. Wu (2011) Defensins in innate immunity. Cell Tissue Research 343, 175-188. A. Peschel & H. G. Sahl (2006) The co-evolution of host cationic antimicrobial peptides and microbial resistance. Nature Reviews Microbiology 4, 529-536. T. Ganz (2003) Defensins: antimicrobial peptides of innate immunity. Nature Reviews Immunology 3, 710-720. M. Zasloff (2002) Antimicrobial peptides of multicellular organisms. Nature 415, 389-395.